I have decided to nominate Seattle as the city with the most quirkily named restaurants! Where else can you find eating places such as The Whale Wins, The Walrus & the Carpenter, or the delightful Brimmer & Hilltap that opened its doors only recently. Some research quickly yielded the fact that the creativity of their owners did not end at the names alone. Meanwhile, we tried to see if we could find some fresh sea-food for lunch. Unfortunately, since we were in Pike's Place Market, every place had a long wait list. This is when some local knowledge came handy; the area behind the market is away from the visiting crowds and home to several interesting eating places. We walked down the stairs behind the marketplace to the waterfront below. 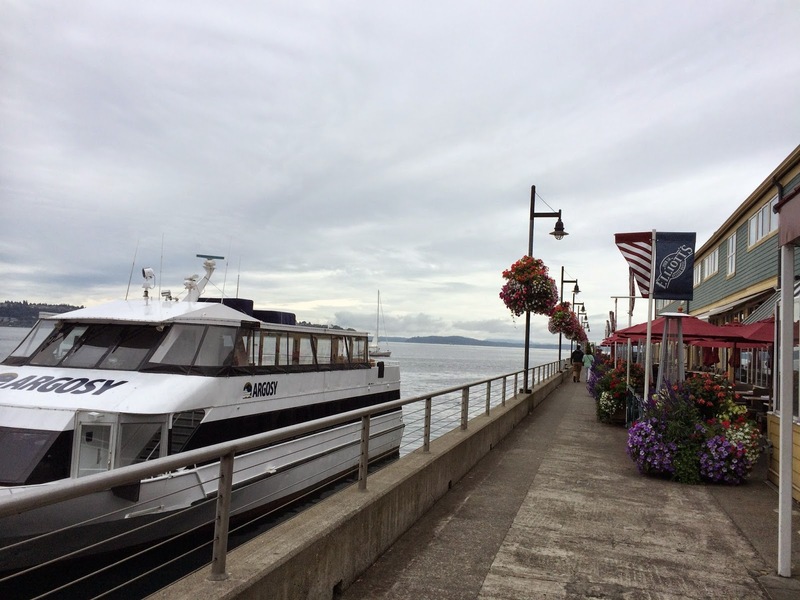 Elliott’s Oyster House is right the waterfront. Outside the immediate vicinity of the touristy marketplace above, this restaurant provides just the right mix of great views, fresh seafood and a good selection of beer. There were oysters galore, but given the rainy, chilly weather outside, I preferred to stay with baked oysters today. They had a pan fried variety and the more familiar Rockefeller on their menu and I chose the later. 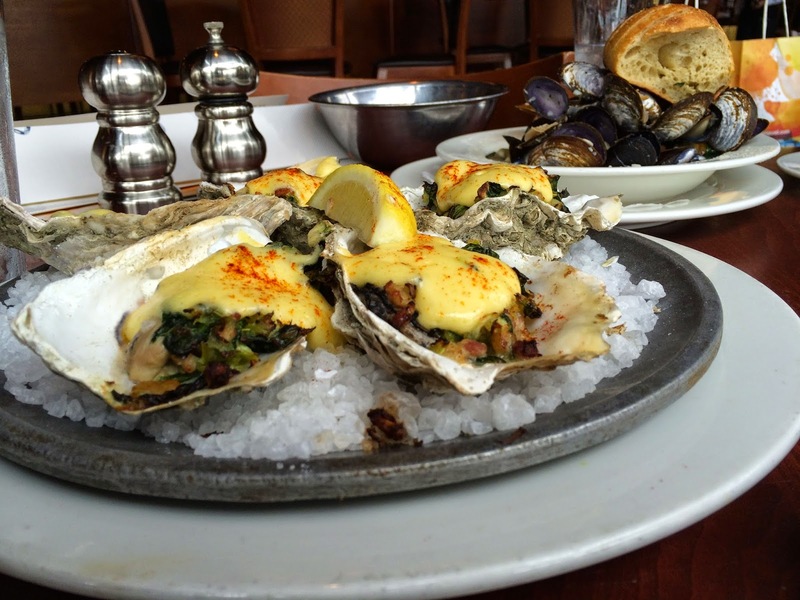 The dish came out looking very appetizing indeed: baked with fresh spinach, Pernod, bacon, and hollandaise sauce, the oysters were perfectly cooked. 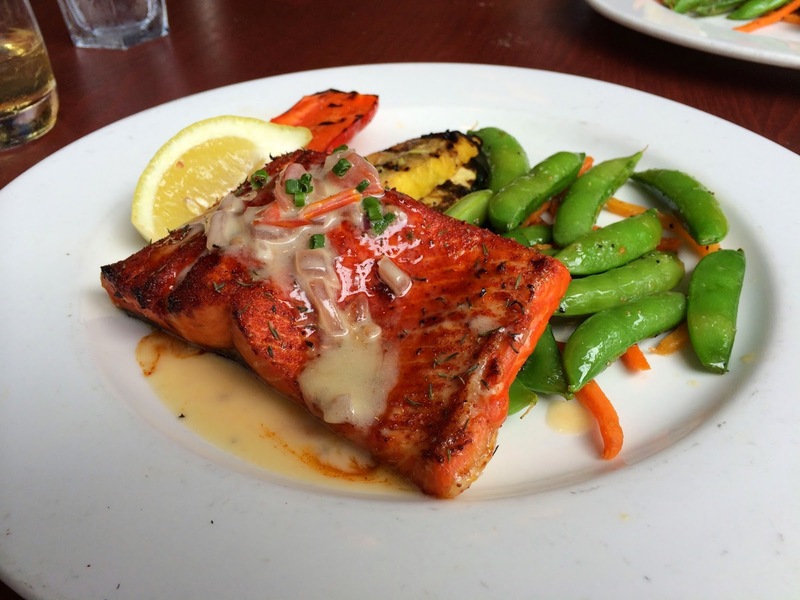 For my mains, I ordered the Wild Pacific Salmon. Elliott's only puts wild, sustainable runs on their menu and they claim nothing here comes from a farm. This is also where I learnt about sockeye salmon from Fraser River of British Columbia. 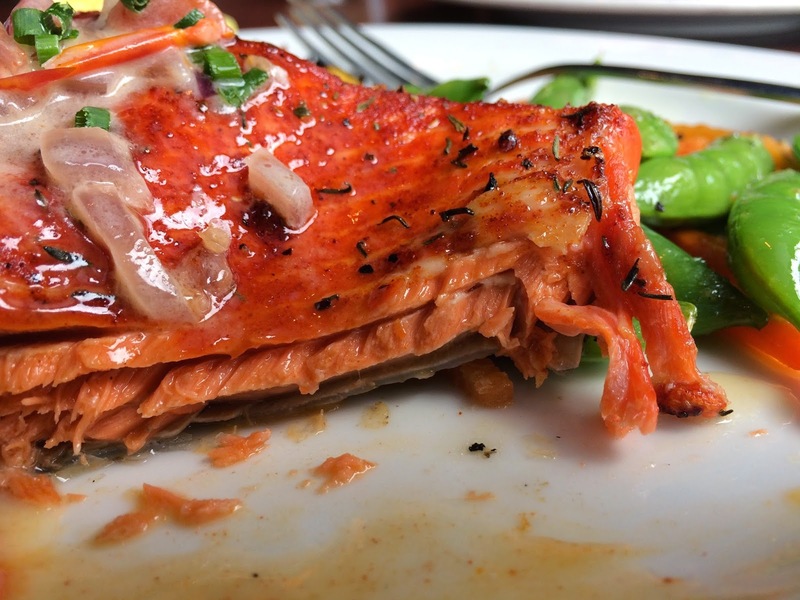 The Sockeye is normally of a lighter color, but it acquires the deepest of red hues during spawning season which makes this fish so distinctive on the plate. They served the fresh fish 'alder planked'. The process involves seasoning the salmon with a house rub and then baking on an alder plank before they serve the dish with grilled market vegetables and finished with smoked tomato beurre blanc. Completely amazing flavor and taste and much more gamey than the regularly variety I am used to. 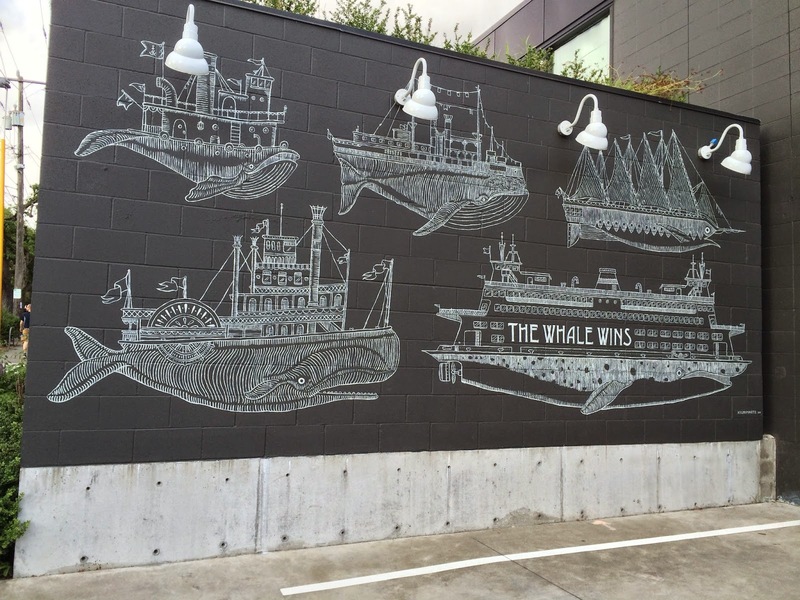 In the evening, it was time for The Whale Wins. The name, incidentally, refers to a painting by the owner's painter friend Kylar Marts. 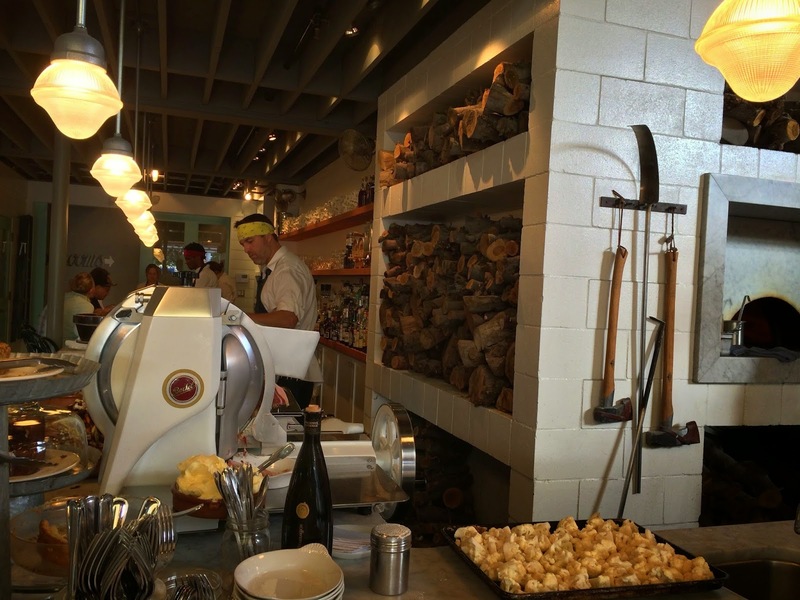 Clearly contemporary rustic is the new thing in Seattle restaurants. 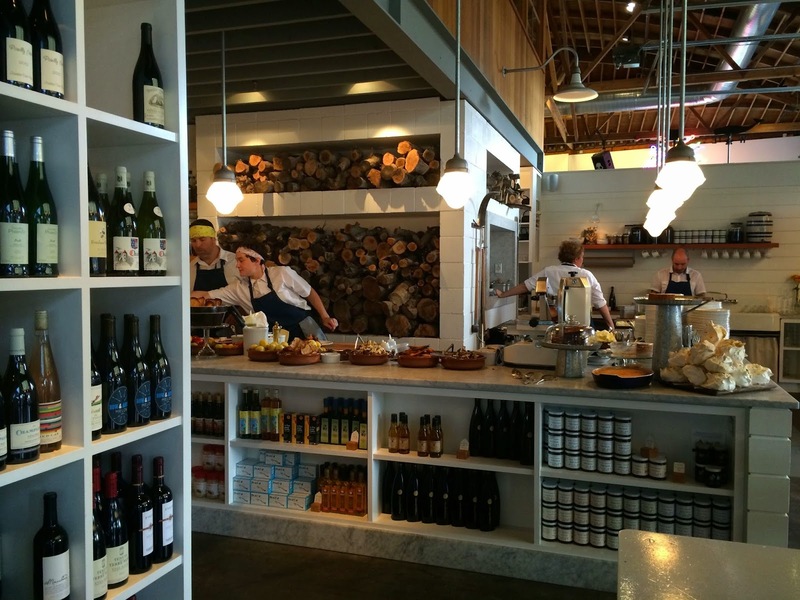 This one had a cool backdrop of logs behind the kitchens and an open al-fresco area too. We weren't very hungry after that substantive lunch earlier and therefore the menu full of small plates suited us just fine. 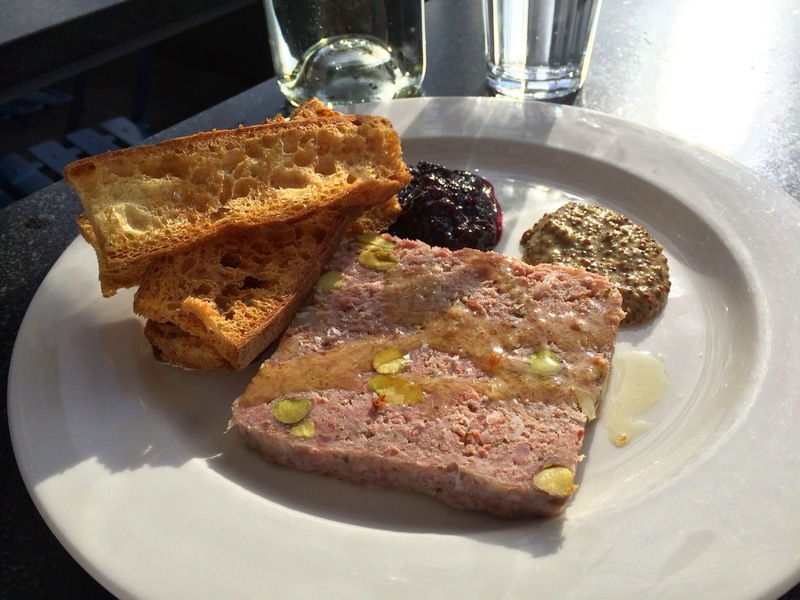 A plate of of Pork and Serrano Ham Terrine, huckleberry mostarda, grain mustard, crostini arrived. The perfectly crunchy bread paired very well with coarsely ground meat of the terrine. The mustard complemented the dish rather nicely. 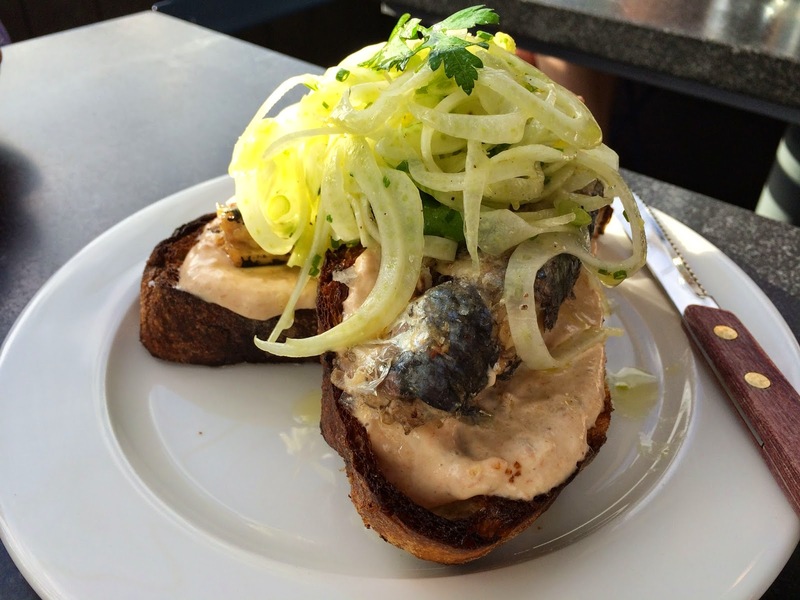 The Matiz Sardines on toast with curried tomato paste and shaved fennel seems to be a favorite of those who favor The Whale Wins. It was a more substantive portion than the previous dish. The flavors and textures made for a very unusual but winning combination. It was the final dish of Cauliflower with whipped feta, mung beans, marinated cucumber, seven minute egg that turned out most popular for us tonight. 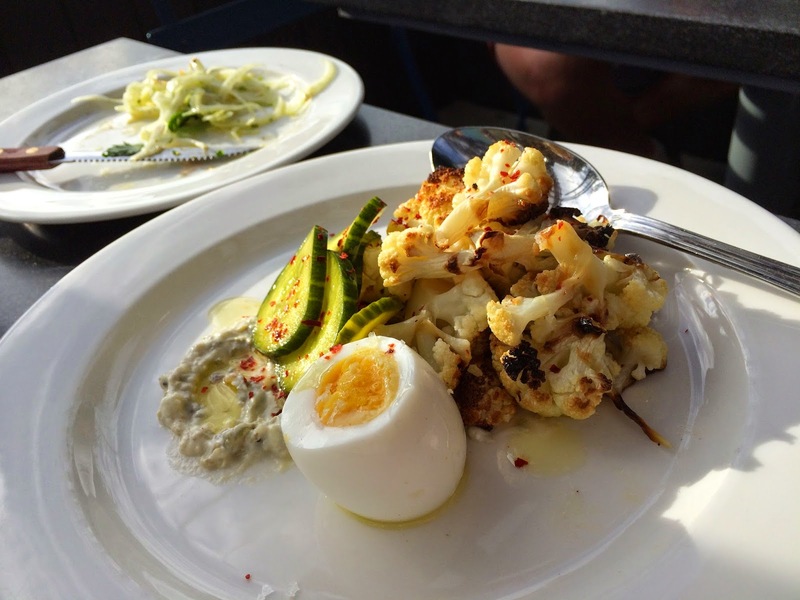 Cauliflower, especially when roasted with a little oil, is something I always find delightful. That said, this combination of ingredients was creative and worked quite well. As I perused the dessert menu, I realized I was seeing a dessert I had never experienced before: a sonker. Turns out, a sonker is an American Classic. I have noticed that truly American food tends to retain a link to the direct uncomplicated flavors of childhood, and the sonker is no different. A sweet, deep-dish pie that is more juicier than cobbler, the sonker is a unique dessert popular in parts of North Carolina. 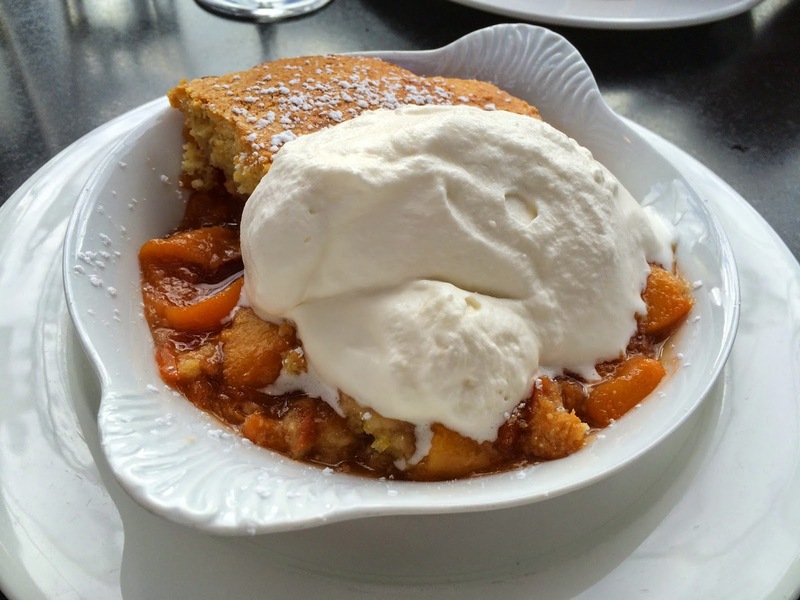 The cornmeal sonker that was served to me today with seasonal fruit and honey whipped cream was every bit as delightful as it sounds. 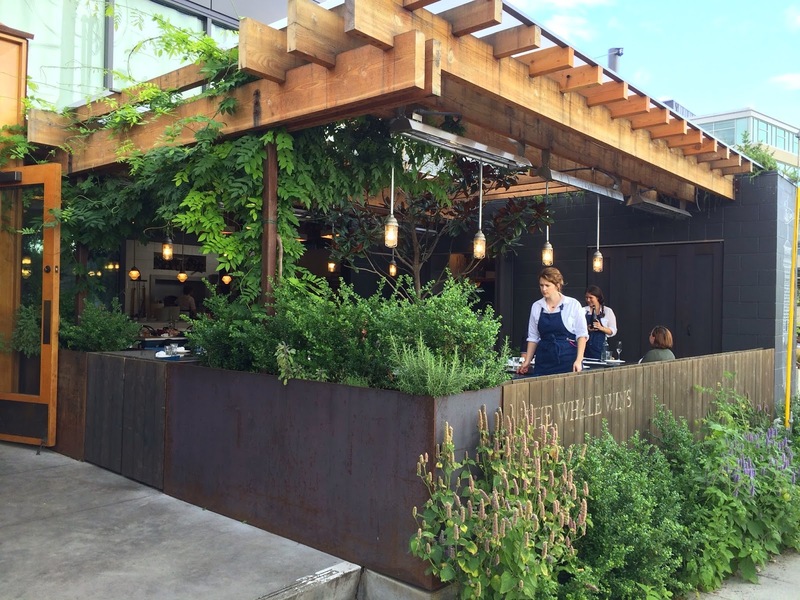 The Whale Wins is one of the many creative, contemporary restaurants I experienced during this brief visit to Seattle. From the little I sampled, I can see that fresh produce, small plates, pickled vegetables and a distinct Asian influence all play equal roles in today's restaurant in this fast growing city Overall, a terrific stopover for any serious foodie!